hahaha, I didn't even realize it had that effect until you brought it up! All did was go in and change the image address to the new logo I hadn't even looked at it until you brought it up! The photo of the jeeps is not photoshop'd At least I didn't edit it, I am not sure who's picture it is, but its pretty good with the sun. How's things going on the logo? Was curious if they'd be done by rock junction and where I can send some money to help out with them ? Shaniquasman wrote: How's things going on the logo? Was curious if they'd be done by rock junction and where I can send some money to help out with them ? Stickers are ordered, I have 50 4" circle decals and 50 3inch circle decals that are clear... They were having a sale on the clear decals and were only available in 3" It was pretty cheap so I figured this is more of a test with the clear. Once I get them and I know they look good and are good quality I will let people pitch in if they like. I am supposed to have them May 30th. I ordered them through stickermule.com they are supposed to be a durable vinyl with a UV protectant making them suitable for the abuse of a being put on a vehicle. Can't wait to put one on. Onlyone wrote: Can't wait to put one on. Glad to hear!! 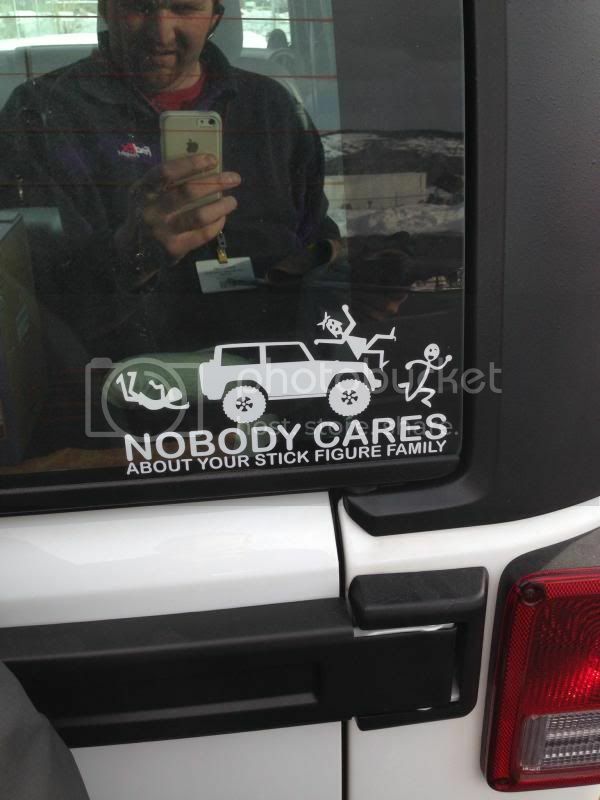 Was it your idea, or do you have the sticker of a Jeep running over the stick family? I would like to do a www.coloradotrailruns.com sticker made, then above the website (which I guess would be the road) have a jeep running over the family.